Searching for a great used car? 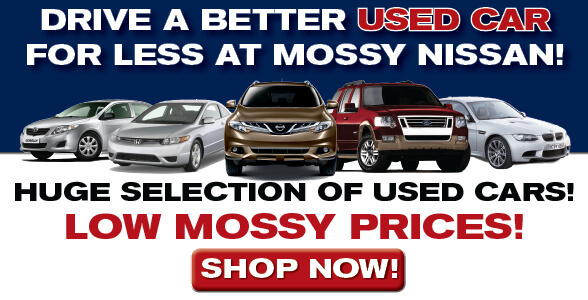 Mossy Nissan has a huge selection of San Diego used cars for sale, plus low Mossy prices and a 2-year or up to 100,000 mile limited warranty* on all makes and models of Mossy Quality Inspected used cars! So you can find the used car you want, save money, and drive home with peace of mind! A 2-year or up to 100,000-mile limited warranty*: All makes and models - including used Hondas, used Toyotas, used BMWs, used Nissans, used Fords, used Hyundais and more! Comprehensive quality inspection & reconditioning of used cars performed by our highly trained technicians! Rental reimbursement if your used vehicle is kept overnight for repairs! This family-owned business has been serving San Diego used car buyers since 1982. Shop our giant San Diego used car inventory! You'll find great San Diego used vehicles for sale that meet your needs and your budget! *At participating locations only. Two year 100,000 mile limited Powertrain Warranty is only applicable to vehicles that have undergone and passed the Quality Inspection or Q-Certification Inspection and Warranty Certification Process. Not all vehicles are Quality Inspected or qualify for the two year limited Powertrain Warranty. Vehicles to be inspected and certified will be selected at the dealers discretion. See dealer for additional Information, details, and limitations.